Nitric acid of commercial interest usually consists of the maximum boiling azeotrope of nitric acid and water, which is approximately 68% HNO3, (approx. 15 molar). This is considered concentrated or technical grade, while reagent grades are specified at 70% HNO3. The density of concentrated nitric acid is 1.42 g/cm3 . 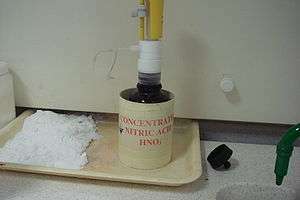 An older density scale is occasionally seen, with concentrated nitric acid specified as 42° Baumé. A commercial grade of fuming nitric acid contains 90% HNO3 and has a density of 1.50 g/cm3. This grade is much used in the explosives industry. It is not as volatile nor as corrosive as the anhydrous acid and has the approximate concentration of 21.4 molar. White fuming nitric acid, pure nitric acid or WFNA, is very close to anhydrous nitric acid. It is available as 99.9% nitric acid by assay. 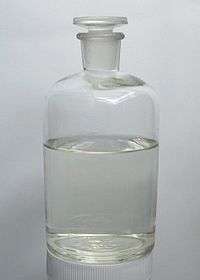 One specification for white fuming nitric acid is that it has a maximum of 2% water and a maximum of 0.5% dissolved NO2. Anhydrous nitric acid has a density of 1.513 g/cm3 and has the approximate concentration of 24 molar. Anhydrous nitric acid is a colorless mobile liquid with a density of 1.512 g/cm3, which solidifies at −42 °C to form white crystals. As it decomposes to NO2 and water, it obtains a yellow tint. It boils at 83 °C. It is usually stored in a glass shatterproof amber bottle with twice the volume of head space to allow for pressure build up. When received, the pressure must be released and repeated monthly until finished. The molecule is planar. Two of the N–O bonds are equivalent and relatively short (this can be explained by theories of resonance; the canonical forms show double-bond character in these two bonds, causing them to be shorter than typical N–O bonds), and the third N–O bond is elongated because the O is also attached to a proton. 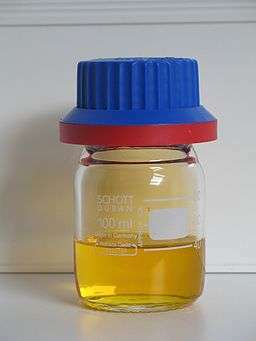 Nitric acid reacts with proteins to form yellow nitrated products. This reaction is known as the xanthoproteic reaction. This test is carried out by adding concentrated nitric acid to the substance being tested, and then heating the mixture. If proteins that contain amino acids with aromatic rings are present, the mixture turns yellow. Upon adding a strong base such as ammonia, the color turns orange. These color changes are caused by nitrated aromatic rings in the protein. Xanthoproteic acid is formed when the acid contacts epithelial cells. Respective local skin color changes are indicative of inadequate safety precautions when handling nitric acid. In organic synthesis, industrial and otherwise, the nitro group is a versatile functional group. Most derivatives of aniline are prepared via nitration of aromatic compounds followed by reduction. Nitrations entail combining nitric and sulfuric acids to generate the nitronium ion, which electrophilically reacts with aromatic compounds such as benzene. Many explosives, e.g. TNT, are prepared in this way. The corrosive effects of nitric acid are exploited for a number of specialty applications, such as pickling stainless steel or cleaning silicon wafers in electronics. Being a strong oxidizing agent, reactions of nitric acid with compounds such as cyanides, carbides, metallic powders can be explosive and those with many organic compounds, such as turpentine, are violent and hypergolic (i.e. self-igniting). Hence, it should be stored away from bases and organics. 1 2 3 4 5 6 7 "NIOSH Pocket Guide to Chemical Hazards #0447". National Institute for Occupational Safety and Health (NIOSH). 1 2 Zumdahl, Steven S. (2009). Chemical Principles 6th Ed. Houghton Mifflin Company. p. A22. ISBN 0-618-94690-X. ↑ Dean, John (1992). Lange's Handbook of Chemistry (14 ed.). McGraw-Hill. pp. 2.79–2.80. ISBN 0-07-016194-1. ↑ Luzzati, V. (1951). "Structure cristalline de l'acide nitrique anhydre". Acta Crystallographica (in French). 4: 120–131. doi:10.1107/S0365110X51000404. 1 2 Allan, D. R.; Marshall, W. G.; Francis, D. J.; Oswald, I. D. H.; Pulham, C. R.; Spanswick, C. (2010). "The crystal structures of the low-temperature and high-pressure polymorphs of nitric acid". Dalton Trans. 39: 3736–3743. doi:10.1039/B923975H. 1 2 3 4 Catherine E. Housecroft; Alan G. Sharpe (2008). "Chapter 15: The group 15 elements". Inorganic Chemistry, 3rd Edition. Pearson. ISBN 978-0-13-175553-6. ↑ Sherman, Henry Clapp (2007). Methods of organic analysis. Read Books. p. 315. ISBN 1-4086-2802-3. ↑ Knowles, Frank (2007). A practical course in agricultural chemistry. Read Books. p. 76. ISBN 1-4067-4583-9. ↑ Considine, Douglas M., ed. (1974). Chemical and process technology encyclopedia. New York: McGraw-Hill. pp. 769–72. ISBN 978-0-07-012423-3. ↑ Urbanski, Tadeusz (1965). Chemistry and technology of explosives. Oxford: Pergamon Press. pp. 85–86. ISBN 978-0-08-010239-9. ↑ "BOMARC Summary". BILLONY.COM. Retrieved 2009-05-28. ↑ Clesceri, Lenore S.; Greenberg, Arnold E.; Eaton, Andrew D., eds. (1998). Standard methods for the examination of water and wastewater (20th ed.). American Public Health Association, American Water Works Association, Water Environment Federation. ISBN 978-0-87553-235-6. ↑ Jewitt, Jeff (1997). Hand-applied finishes (illustrated ed.). Taunton Press. ISBN 978-1-56158-154-2. Retrieved 2009-05-28. ↑ O’Neal, C. L.; Crouch, D. J.; Fatah, A. A. (2000). "Validation of twelve chemical spot tests for the detection of drugs of abuse". Forensic Science International. 109 (3): 189–201. doi:10.1016/S0379-0738(99)00235-2. PMID 10725655. ↑ Paul, May (November 2007). "Nitric acid". Retrieved 2009-05-28. ↑ "Nitric acid: Toxicological overview". Health Protection Agency. Retrieved 2011-12-07.